April, time to go to Bremen to network and see some young musicians perform. 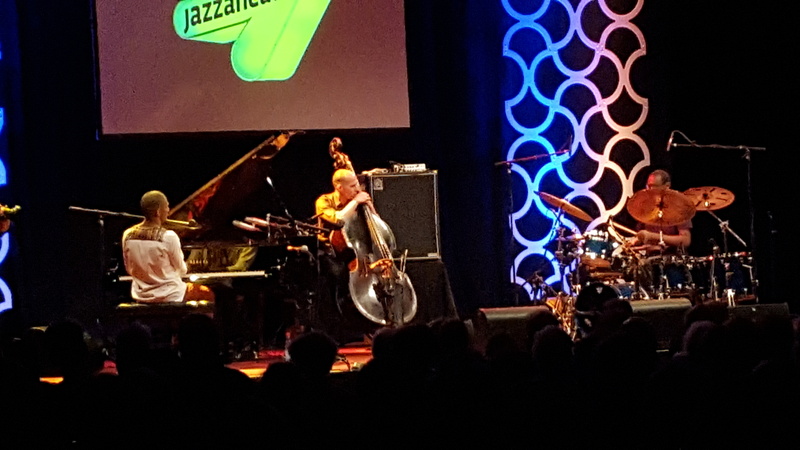 jazzahead is the global meeting for the jazz industry and as every year has been inspiring and extremely interesting thanks to the presented music. Inspiring because the mood throughout the convention was very upbeat and positive, despite all the problems that have arisen with music delivery going to the streaming world in a rapid tempo, one change the jazz consumer isn’t participating in as fast we would need. Positive, as this situation is seen as a challenge to question old and now dysfunctional models in the industry and to come up with valid answers – a period of transition in many aspects. And a period of great music from all corners of the globe. This year’s country focus was on Poland, a country that historically has a lively and unique jazz scene and still produces amazingly talented musicians today – young pianist and composer Kasia Pietrzko (who didn’t perform at the showcases the country had to offer) being only one very good example. I missed the Polish night showcases on Thursday night, simply sitting outside the venue talking to other label heads about the state of the business and enjoying a warm spring night, but from the TV recordings, which can be watched at the jazzahead website, the performances by Marcin Wasilewski, Joanna Duda, Monika Borzym and the Atom String Quartet seemed to have gotten great receptions by the international audience. 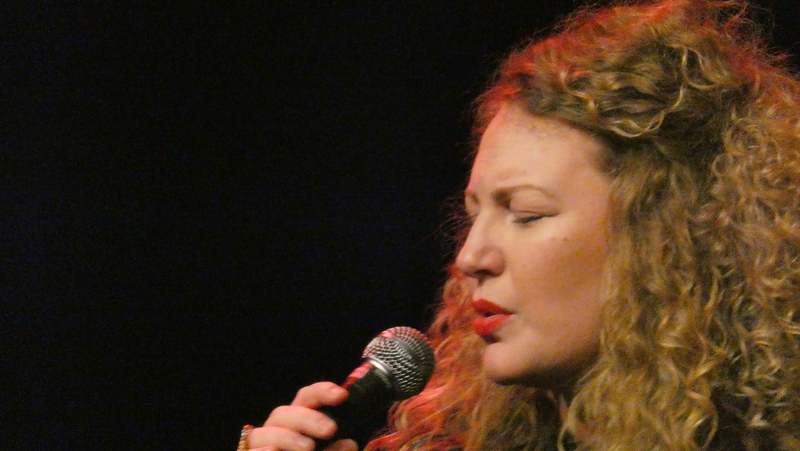 The first act I squeezed in between meetings on Friday was by Swedish singer Emilia Martensson and her band featuring Fulvio Sigurta on trumpet, Luca Boscagin on guitar, Sam Lasserson on bass and Adriano Adewale on percussion. A powerful and in her Swedish roots based jazz singer with a very unique style and a group that perfectly supported her – I need to follow up on her and check the recordings. Next was new group LASSEN, featuring musicians from Belgium and Norway and performing a straight and highly individual jazz set, reminiscent of early and edgy Jan Garbarek, but still modern and accessible. The group consists of Harald Lassen on sax, Bram de Looze on piano, Stian Anderson on bass and Tore Flatjord on drums and will release their first album soon on Jazzland recordings. Worth checking out. After that I heard a bit of the concert by Adam Baldych with the Helge Lien Trio – sitting outside to watch the gig on a big screen and enjoying a beer … not bad at all, especially as violinist Baldych and Lien delivered a concert of great music between classical and jazz, with swing and room for explorations. The last show for me on Friday night was by the Finnish Pauli Lyytinen Magnetia Orkestri, featuring beside Lyytinen on sax the amazing trumpet player Verneri Pohjola, Mika Kallio on drums and Eero Tikkanen on bass. The first thought that came up when listening to their music was: Edvard Vesala! The Magnetia Orkestri has the same playfulness, power and melodic approach as some of Vesala’s music. Fresh and exciting and played on the highest level. Saturday’s showcases started for me with German sax player Paul Heller, who grouped with Dutch jazz legend and keyboarder Jasper Van’t Hof, Martin Gjakonovski on bass and Bodek Janke on drums to deliver a jazz and fusion show of top quality. After that it was Okeh recording artist Markus Stockhausen, who presented his latest album ‘Far Into The Stars’ live to an enthusiastic audience. 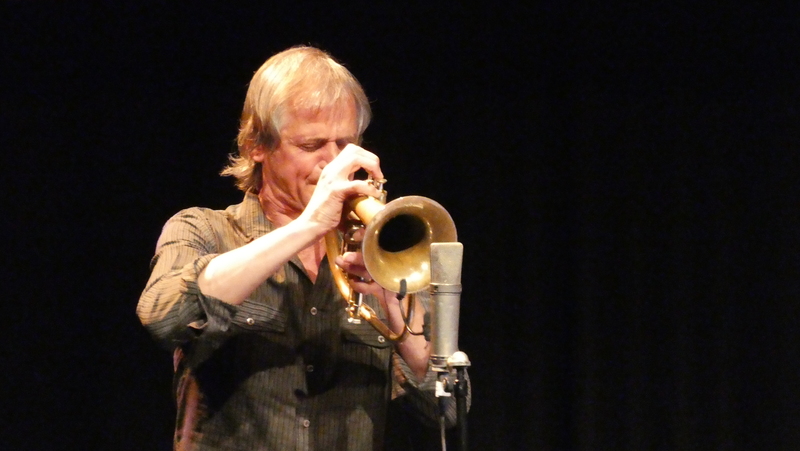 His band Quadrivium, with Angelo Comisso on keyboards, Joerg Brinkmann on cello and Christian Tomé on drums, created beautiful sounds and grooves for Stockhausen to lay his enchanting trumpet melodies on top. Live and on record this is special music by a very special composer and performer. 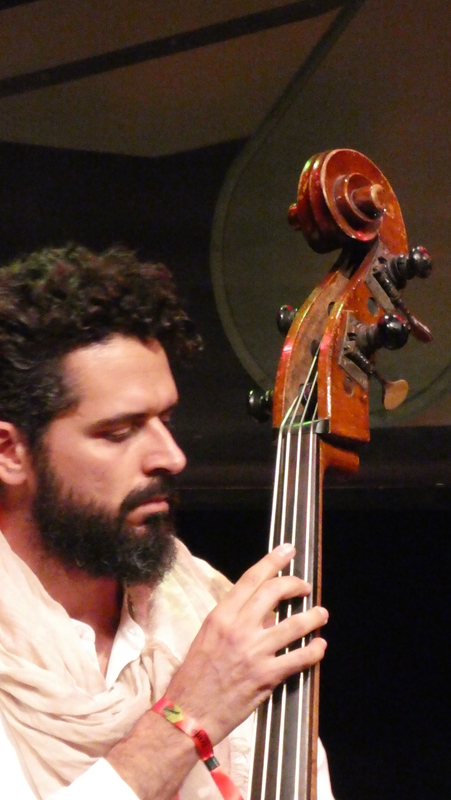 Petros Klampanis, the Greek bassist who lives in New York, and his group performed a wonderful set based on Klampanis’ compositions, which take the listener to melodic excursions between jazz and classical music – dreamlike, accessible and beautiful. And with the immensely talented pianist Kristian Randalu, who recently released his first album on ECM, Bodek Janke on drums and a string section consisting of Olga Holdorff and Sofia Baltatzi on violin, Sara Rilling on viola and Gregor Furhmann on cello, he had the band to perform his music to perfection. I wanted to see Jazzmeia Horn a bit later, but didn’t make it into the venue, so full was the place – instead I watched the performance on TV and did enjoy her show a lot – she truly is a special talent and her vocal skills and her scatting are very impressive. Looking forward to see her again hopefully soon and on stage instead on a screen. Pianist Gregory Privat really got his audience in his showcase with Chris Jennings on bass and Laurent-Emmanuel Tilo Bertholo on drums. Rhythms from Martinique and a general influence from Caribbean music are informing his very personal style of jazz. A great musical understanding within the trio did help to make this a remarkable set. 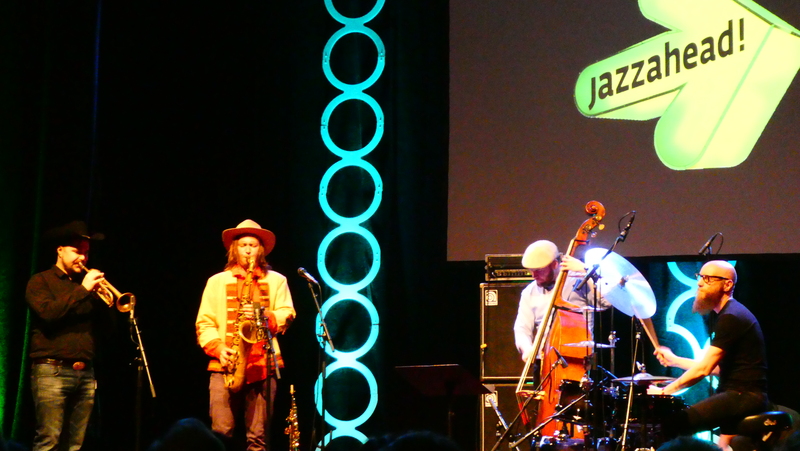 On recommendation I went to see the show of the ACA SECA trio, which started 20 past midnight …. but left after 2 songs as the sound in the room was simply unbearably bad and one couldn’t really enjoy the music, which seemed to be really interesting. Pity. 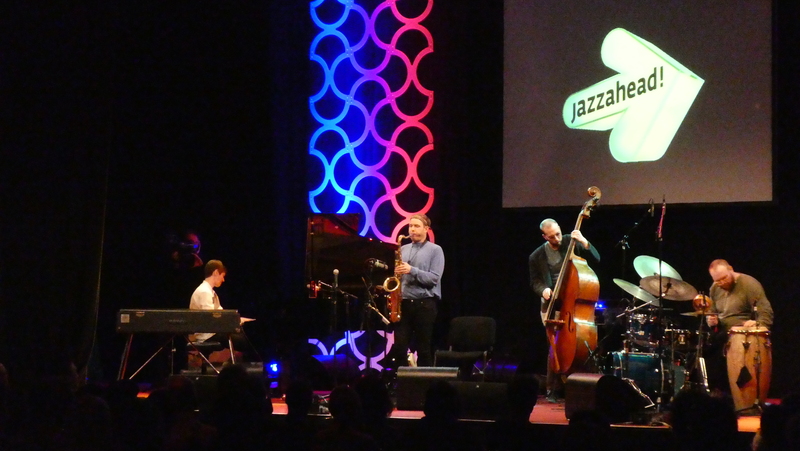 jazzahead is a celebration of jazz, of improvised music in all its forms. It is not an industry event for clapping each other on the shoulder, but an exchange of necessary ideas for changing the way our music is distributed, marketed and brought to a wider audience. Streaming as such is not the real problem – the problem is to get the jazz audience to switch to the new form of listening to music and they will, once the streaming services have improved the way this music (and classical music as well) is presented in a way the consumer wants it to be.